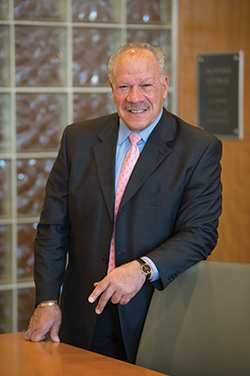 After 40 years of leadership and service to Syracuse University, Larry Martin announced he will retire from his post as vice president of program development at the end of 2015. Martin has served at the helm of Syracuse’s Office of Program Development since 1995, engaging the University’s African American and Latino alumni at unprecedented levels. During his 20-year tenure, the Office of Program Development hosted nine alumni reunion weekends and eight off-campus trips, including a journey to South Africa for 140 alumni in 2007; raised and awarded more than $3.1 million in scholarship aid to talented African American and Latino Students through the Our Time Has Come Scholarship Fund; published a semi-annual magazine, The Syracuse Manuscript; produced art exhibits (in partnership with the Community Folk Art Center) featuring some of America’s pre-eminent artists, including Romare Bearden, Jacob Lawrence, Pérez Celis and Gordon Parks; and led efforts to retire the jersey of one of Syracuse University’s greatest sport stars, pioneering airman Wilmeth Sidat-Singh ‘39. In addition, Martin was instrumental in organizing efforts to recognize the Syracuse 8—nine members of the Syracuse University football team who boycotted the team in 1970 to protest inequities within the athletic program. In 2006, the former players were awarded the Chancellor’s Medal for Outstanding Achievement and cited for their extraordinary courage. Last year, their story gained a wider audience through the book “Leveling the Playing Field: The Story of the Syracuse 8,” published by Syracuse University Press. Martin joined Syracuse University as director of development in 1977 and was part of the task force that built the Carrier Dome, the first facility of its kind on a college campus. Following the successful campaign to complete the Dome on time and within budget, he subsequently became part of the $35-million Capital Campaign team and represented the university in the Midwest, cultivating and soliciting alumni for major gifts to the University.